Printswitcher provides a solution to change your standard printer in Windows by command line, script, or batch file. So users never have to change printers again. Printswitcher provides a solution to change your standard printer in Windows by command line, script, or batch file. So users never have to change printers again. 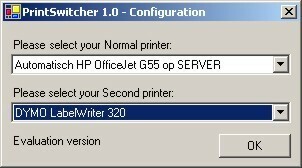 Also the ability to set to the original printer before you used printswitcher to switch. Very important: Requires .Net Framework 1.1 or higher.